*As Patreon charges on the day you join and the 1st of each month thereafter, subscribing toward the beginning of the month is your best option. I know you do post trading/investment tips but hoestly your recent ones have been dissapointing. I get that you re not some wizard but still… People here take your opinion very seriously, have that in mind. May I ask which investments you are referring to? Like I said you are not a wizard so the otw is not exactly your fault. Was a good tip, unfortunately we didnt have luck. As a result Dembele and Golovin are a lost cause now, Murillo and Iborra as well. Those informs price dropped, especifically that 83 Hamdalah. Im unsure if it will rebound short term. The cavani one and the high rated bayern players, although these last werent that bad were not that good investments. A majority of what I recommend is based on what has happened historically. No one was expecting EA to change up the OTW promotion and do Headliners instead. As for Hamdallah, I tweeted out 12 hours before the promotion that it would be in your best interest to sell before the promotion dropped. Ribery wasn’t too profitable, but Thiago and Süle both offered decent returns. As for Cavani, he peaked earlier than I expected. In retrospect, he was a bit to expensive to offer a decent ROI. 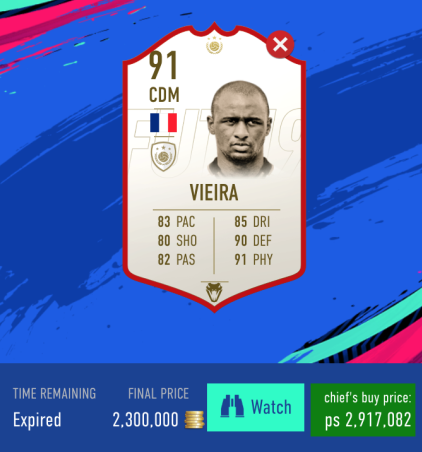 I won’t be recommending players that are that expensive again. I made 100k profit on Sule. Hardly a bad recommendation..! Do you think pogba will drop to under 250k over the next week or so due to the promo’s. He is out of packs due to being in the FUT Headliners, so I don’t think he will dip much. He is decent at 20k. Investments on fifa, like in real life, are almost always a gamble. You gotta take a few licks to learn how to make the cheddar provolone. 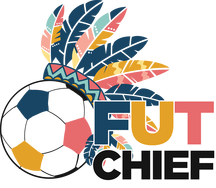 You look at past trends to make future predictions and some people, like Chief, are just exceptionally good at it. He cant get 100% of everything right. 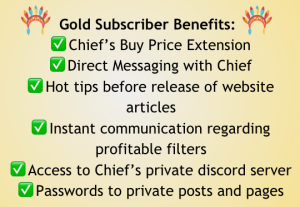 All in all if you listen to Chief you WILL eventually make a lump sum amount of coins. I started following about a month ago and already made +600k. Just stick with it. I’m just wondering when you think the market will drop substantially because I want to buy my new team and play but I don’t want to risk buying it and then the market drops. I am aware that the longer I wait the cheaper my team will be but when do you think it will have a noticeable dip so I don’t lose too much. I would buy after Lunar New Year pack promotions. I would sell and move on. It’s a bummer, I know. No one expected EA to change up the promo like that. 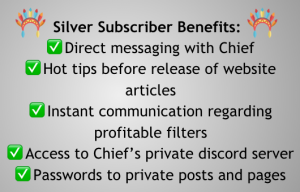 Hey Chief, what is the private discord? Thinking about becoming a patreon. It’s for patreons only. 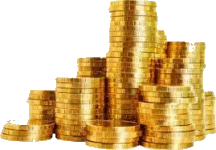 I discuss investments/sniping filters/trading methods in real time. I’m also much more accessible than I am on the website. What do you think about Neymar’s price in next weeks? Would it be good if I buy him after this weekend league? I think he will dip further with Lunar New Year pack promotions. Hi Chief, what do you think about casilla real Madrid card for 800? 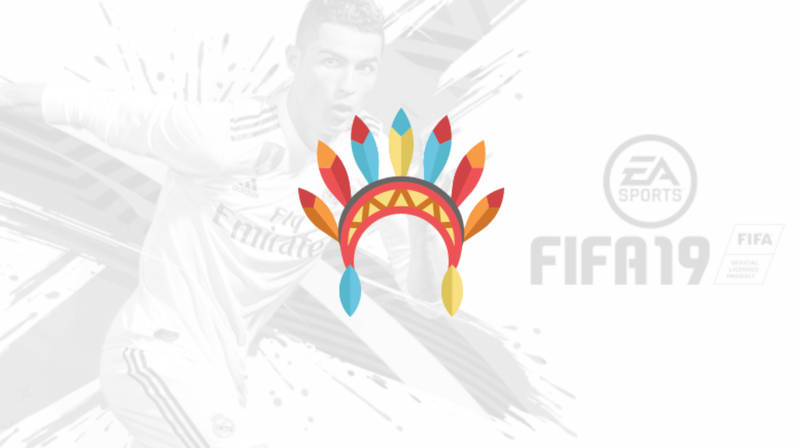 Chief, are your price recommendations based on the PS4, XBX or PC market? 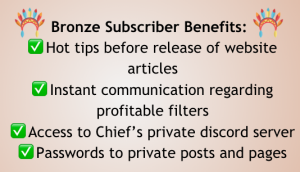 If there’s an FAQ I should read before subscribing, please let me know. Xbox/PS4. PC tend to be more expensive. Is Aguero a good investment for 130K? He is too expensive for my liking. The ROI won’t be as good. Also, with potential LNY packs on Tuesday, he could dip for that.